Who is required to have a meal plan? All first-entry (i.e. first time entering college) students living in University Housing are required to be on a meal plan during their first two semesters, regardless of academic standing. Once you’ve signed up for a plan, you will automatically be enrolled in the same plan for the spring semester unless you change your selection online or visit the Wolfpack One Card Office in Talley Student Union. Is there a meal plan contract I can review? Yes, click here to review your meal plan contract. When can I use my Meal Credits? Meal Credits, which are used to make purchases in restaurants and cafés, can be used once per meal period. We offer a total of 35 meal periods throughout the week (Saturday – Friday) as follows. Please consult our online hours of operation to determine the individual hours of operation for each dining location. Breakfast: Opening – 10:30 a.m. Early Lunch: 10:30 a.m. – 1:30 p.m.
Late Lunch: 1:30 p.m. – 4:30 p.m.
Dinner: 4:30 p.m. – 9:00 p.m.
Can I buy Dining Dollars only? Dining Dollars are a component of the meal plan and cannot be purchased separately unless you qualify for the Commuter/Apartment Plan. The Commuter/Apartment Plan is the only plan comprised solely of Dining Dollars and must be purchased for the initial $750. Dining Dollars roll over from semester to semester and if your balance is low, you can always add more throughout the semester. What if I don’t use all of my Dining Dollars in a semester? Unspent Dining Dollars will roll forward from semester to semester during the student’s enrollment. Dining Dollars will only be refundable for the semester in which they were purchased, when canceled by September 30 for the fall semester and January 31 for the spring semester. No. If your plan has “meals per semester” options, use them accordingly. The only meal plan features that roll over are Dining Dollars. Am I eligible for the Commuter/Apartment Plan? Students living in Wolf Village, Wolf Ridge, Western Manor, E.S. King, Fraternity/Sorority Housing, or off campus are eligible for this plan. This is also a popular plan for students living in Stanhope or Valentine Commons. This plan consists of 750 Dining Dollars and offers a five percent discount at the register. How will I be billed for my meal plan? Meal plans are billed by semester through the cashier’s office. While we begin meal plan registration in the spring, we don’t send charges to the cashier’s office until June. Charges may take up to two weeks before they are reflected on your cashier’s office statement. This wait may be longer during the winter break as the university is closed. When will my meal plan be active? For the spring and fall semesters, plans are active between the first and last day University Housing is open. If you desire for your plan to be active the day you arrive, complete your meal plan sign up at least 48 hours prior to arriving on campus. There are a few times during the academic year when NC State Dining is closed, including Thanksgiving, Winter Break and Spring Break. As major university breaks approach, please consult our Hours of Operation for specific openings and closings. I’m ready to choose a plan – where do I sign up? You can register online for a meal plan during the enrollment period. Charges will be sent to the cashier’s office, but please allow up to two weeks for the charges to appear on your bill. I’m worried I’ve selected the wrong plan. Can I make changes? 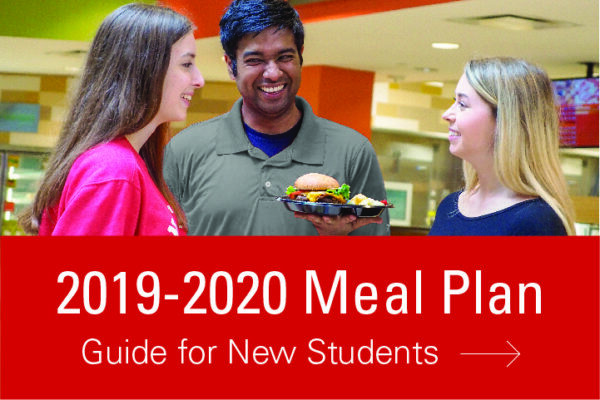 Meal plan selections can be changed until September 30 for the fall semester and January 31 for the spring semester. Visit the Wolfpack One Card office in Talley Student Union, or make changes online. I have additional meal plan questions – who do I contact? We’re here to help! You can call the Wolfpack One Card Office at 919.515.3090 or submit your question online.